I received the device in a box featuring a cute graphic depicting an outline of top-class HD2 around a detailed image of HTC HD mini with arrows emphasizing the diminutive size of this new device. The change in size naturally required some changes in the configuration, such as a new HVGA screen resolution and the latest Qualcomm series 7 processor ticking at 600 MHz. Although the installed version of the Windows Mobile 6.5.3 operating system is much better adapted for finger control its predecessors, HTC did not forget to bundle its own applications package including the ever better HTC Sense user environment. 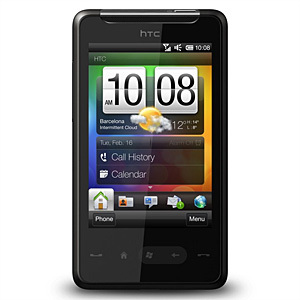 If you wish to learn more about the HTC HD Mini, read on. This review features more videos than earlier articles. The videos are available on this YouTube channel (including 1280 x 720 HD format, no English however) together with all other (older) videos. The reviewed device had an English ROM version 1.07.479.1 WWE and radio version 0.63.05.05. Other versions and configurations may show different performance results. HTC’s HD2 is one of the most popular and best-selling Windows Mobile devices ever, yet not everyone likes it for various reasons. 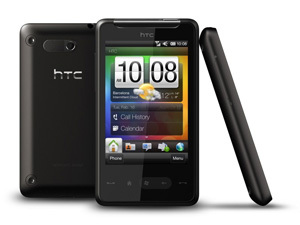 That is why HTC came up with its lighter version and called it aptly HTC HD mini. The main three differences include the size and resolution of the screen, processor type and clock speed, and a smaller size and weight. The screen is more than an inch smaller, at 3.2 inch, and boasts a smaller HVGA resolution of 320×480 pixels. This is why it is a little coarser. The bigger device’s extremely powerful Qualcomm Snapdragon processor ticking at 1 GHz was replaced by a lower-class 600-MHz chip, which did not affect the overall performance very much, fortunately. The significantly smaller size will be seen as an advantage by those who find the HD2 too large to hold. Currently, HTC HD mini is available in the Czech Republic only from independent vendors and one operator, O2, which means you can save substantially if you become their customer. The traditionally small box with colour print includes only a very basic set of accessories, which is hardly surprising at this price point. The most noteworthy item in the box is an elegant, minuscule AC adapter (weighing just 36 grams) which plugs into the mains outlet and connects to the device by the bundled microUSB cable. An ideal travel solution. The earphones with a one-button control and microphone are mediocre, in line with the standard. If you are serious about listening to music, you will quickly replace them with something better. The enclosed CD carries user manuals in various languages. And the pile of brochures and leaflets includes a brief beginners’ guide, among other things. There is no protective case or memory card included in the package.